I was a guest of We Are Paradoxx for the launch in Belfast. Post features gifted products and affiliate links. I’m not sure anyone out there would deny that the beauty market is a pretty over saturated one right now. The list of brands established and new is pretty endless and you could say all bases are covered for whatever your needs are. But despite that, there are still gaps to be found and opportunities to be had. Older brands perhaps need to continue to develop and evolve and new brands need to innovate and lead the way with new ways of doing things. I’ll be honest and say as a general rule (not exclusive or anything) a new brand will need to be pretty special to really catch my eye. Of course I’m not closed off to exploring new brands or looking at something different. However, I do naturally tend to gravitate to the bigger names, established brands that I already know and love. Is that the right thing to do? Debatable. But it’s just something I naturally tend to do. However, from time to time a new brand or two comes along and does get my attention. Either by something as superficially appealing as packaging (shallow, but it counts) or with their message, ethos or just outstanding products. Well, a new brands for hair care has definitely caught my attention and I want to tell you a little more about it. 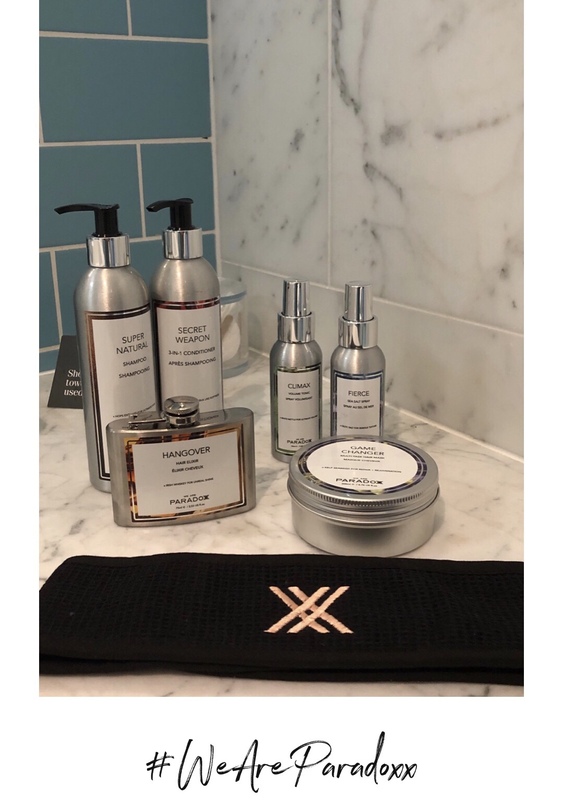 The brand is We Are Paradox and it’s a hair care brand that originates out of Northern Ireland, roots that are present in the products (not just for show, but ingredients that actually work to make them more effective). 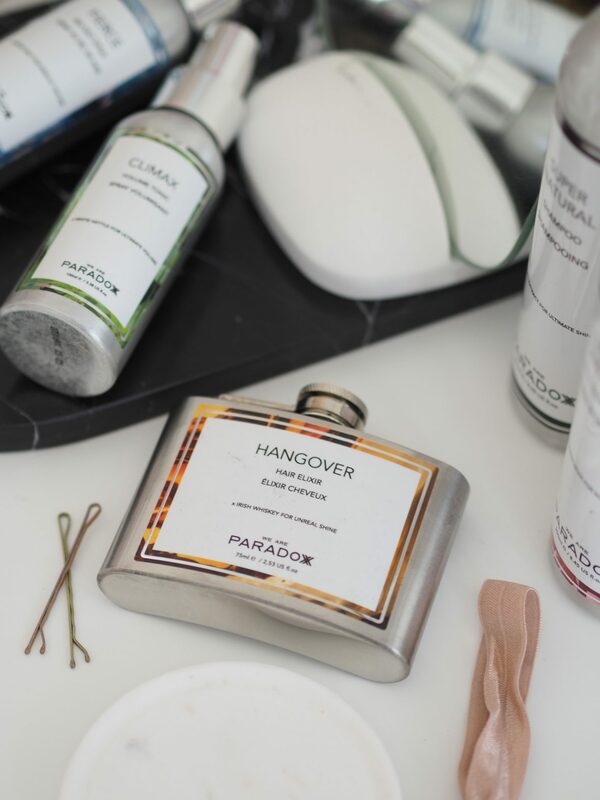 Including things like Irish Whiskey in their ‘Hangover’ hair elixir. The new launch collection features a compact edit of five products across care and styling. A shampoo, conditioner, mask, hair elixir (oil/serum type thing), salt spray and volume spray. With potentially more launches to come but that’s all TBC right now. The brand is launching into a few big name retailers, including Harvey Nichols, ASOS, Amazon, Next, Feel Unique… pretty extensive for a new launch brand and it certainly says a lot for them to have impressed that selection of retailers enough to stock them from the word go. But what is it that’s impressed them so much? Well, the packaging is a style I’ve not seen before. With aluminium bottles and v.minimal plastic, with a goal of being plastic free as soon as they can. The only element that does have plastic is the pump. The packaging manages to combine being eco friendly (aluminium can be recycled endless times, unlike plastic and if it is ever dumped somewhere it shouldn’t be then it also doesn’t release harmful chemicals in the same way plastic does). The products themselves are all vegan friendly and don’t contain nasty preservatives or additives but at the same time they’re effective and actually do what they’re supposed to. I was invited on a trip to Belfast to meet the founder, explore the city a bit (FYI Belfast is an ace place full of amazing architecture, friendly people, and interesting/complex history) before celebrating the launch. The founder, Yolanda comes from a product development background in the beauty industry and whilst she realised she was spending all this time looking into clean but effective beauty products for her skin and makeup she realised there was a gap in the hair space. 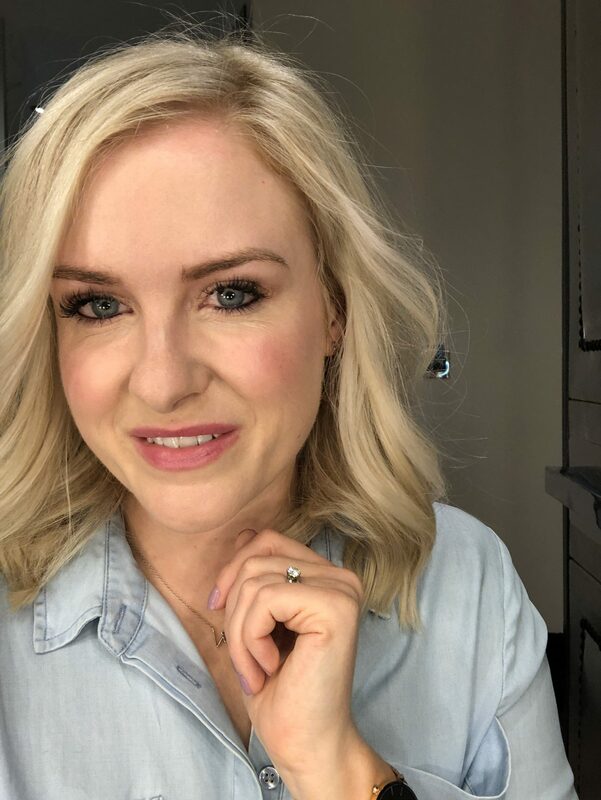 So she set about creating that brands that sat in a happy middle between being instagram-worthy and desirable, but also largely ‘clean’ natural and effective. However, the salt spray, volume spray and elixir. All absolutely ace for my hair. 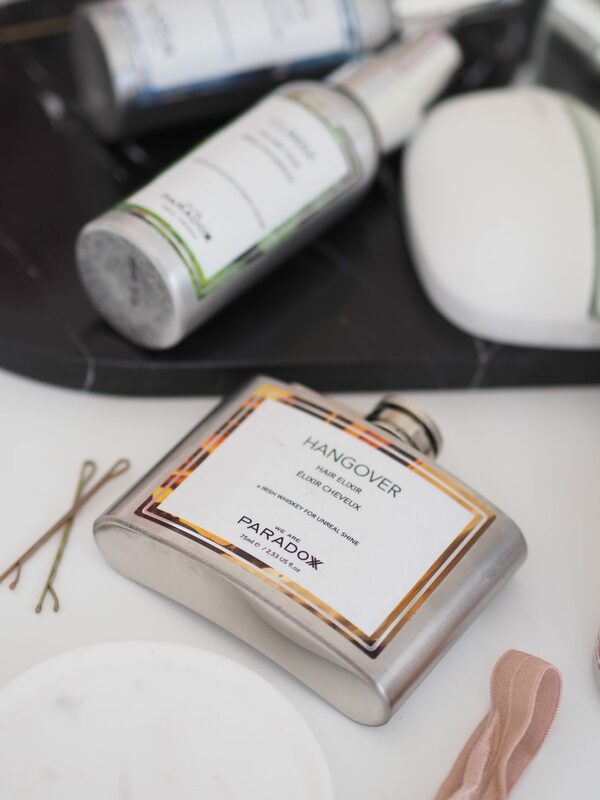 The elixir comes in a hip-flask style bottle which is pretty cool and a nice little nod to the Irish drinking culture…. A little goes a long way for this and it can be used on wet hair to generally smooth and tame or on dry to help control flyaway. As someone with post-baby re-growth this is where it came in very handy. The volume & sea salt spray worked great too, on second day hair it still felt like it had some ‘oomph’ which is exactly what i want from a styling product. Not something that will last a day and be over and in need of a wash again. 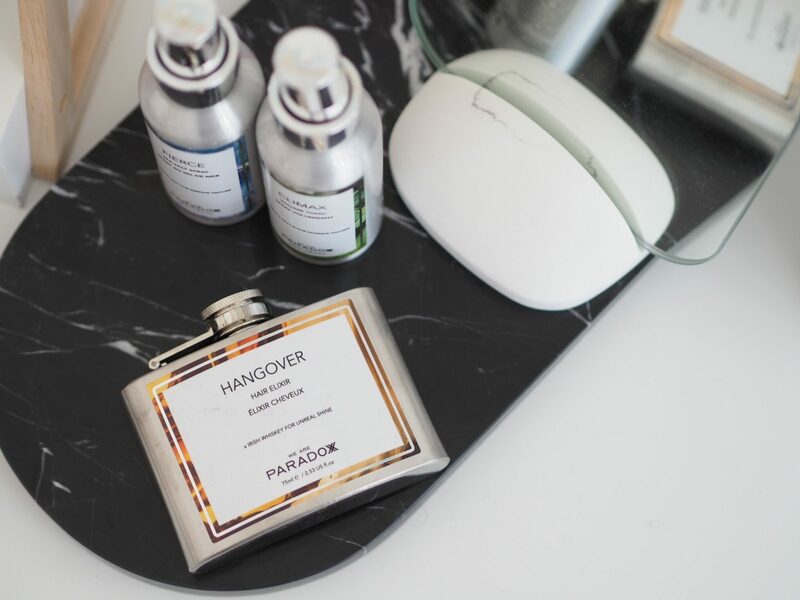 The Hangover Elixir (which is the hero product) or the Salt Spray would be my top choices. 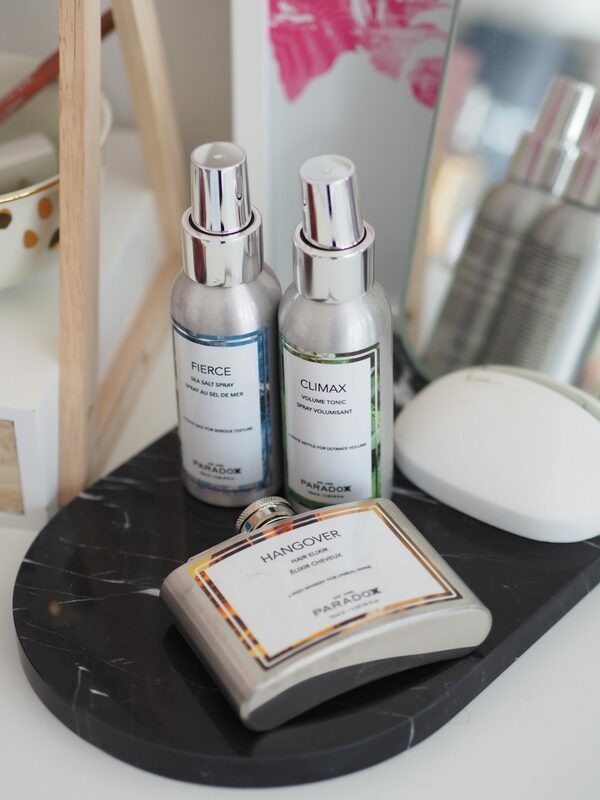 It’s a great new brand, with a charismatic and passionate founder who has worked so hard to get this brand to where it is in the space of just two years. For the range of retailers to be taking it from launch you can already see there’s definitely something special there and I’m excited to see what the future holds for Paradoxx and what comes next!